Nik Wallenda is an American tightrope walker and aerialist born in 1979. He is part of the famous Wallenda circus performer family. 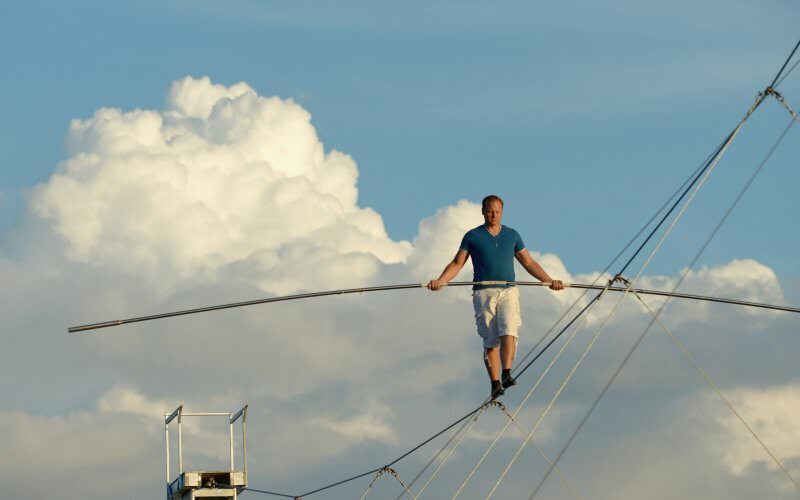 He is known for his walks across Niagara Falls, The Grand Canyon, and other hi-wire stunts. 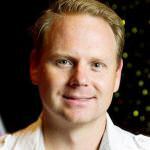 Wallenda announces he will walk along the 400ft tall Orlando Eye, the largest observation wheel in the U.S. on April 29, as part of the attraction’s grand opening ceremony. Instead of crossing a wire, he will walk from one capsule to another along part of the rim of the wheel. He will not use a balancing pole and there will be no wire to catch him if he falls. If I have any missteps, I can’t stop. [I want to] to show a little bit of diversity in the family. 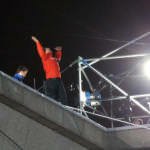 He had planned to grab onto the wire and stay there if he lost his balance or slips. He practiced slipping and then clutching the cable at his training grounds in Sarasota. 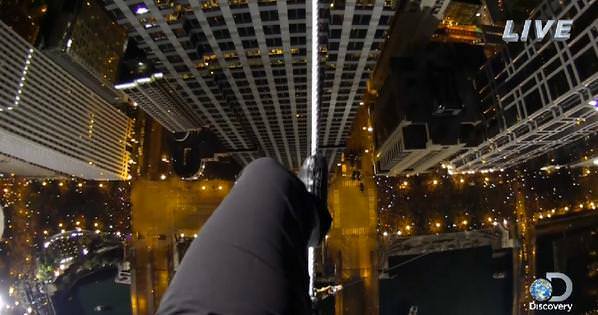 A still from Discovery Channel’s live footage shows the view downwards from the wire as a blindfolded Wallenda makes the crossing between Marina City west and east towers. 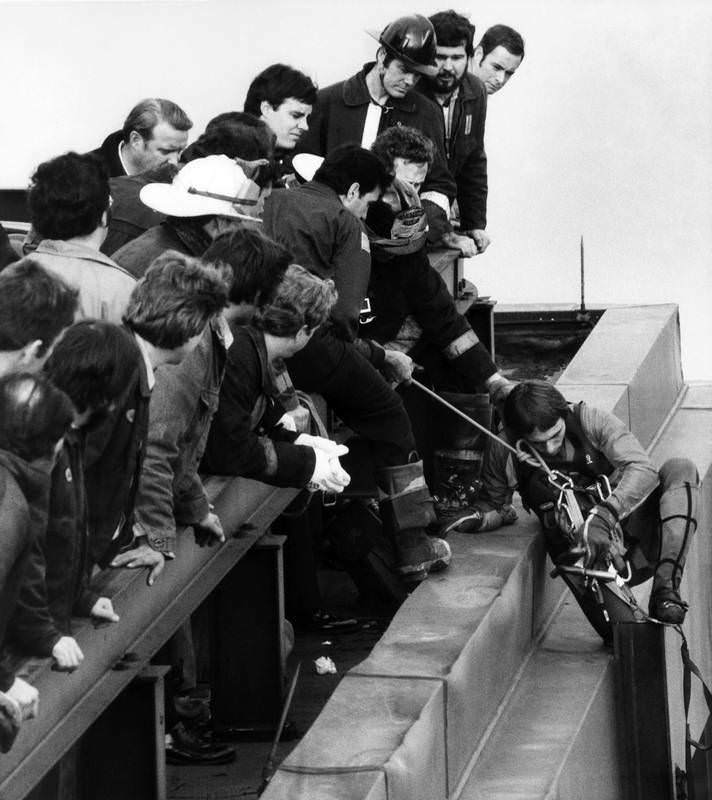 The Chicago Tribune outlines some details of how the stunt is performed. Wallenda’s leather walk shoes are handmade by his mother, Delilah. He has a new pair for the Chicago walk. The balance pole is 24 feet of seamless, stainless steel tubing that weighs 45 pounds. The first wire is about 3/4 inch steel and can hold 70,000 lbs, about the weight of 20 midsize cars. The second wire is rated at 42,000 lbs. Something happens when your life is on the line. There is no pain. There is no tired. When Nik steps out on that wire, he’s going to be there. He has to be in that place. We all have one thing in common. When it comes time to do what we do, we drop into this zone. There is bliss. It’s nerve-wracking wearing a tether. The truth is, the dangers are real—I know; I’ve trained for them, I’ve prepared for them, and everything I do is calculated. I’m doing this because I love what I do. I know it’s hard for people to comprehend. That’s why people watch. There’ll be more hits on Facebook for an accident then there’ll ever be for making it safely, because that’s what people want to see. As much as they say they don’t, they’re fascinated with it and that’s why we break records every time I do these TV specials. 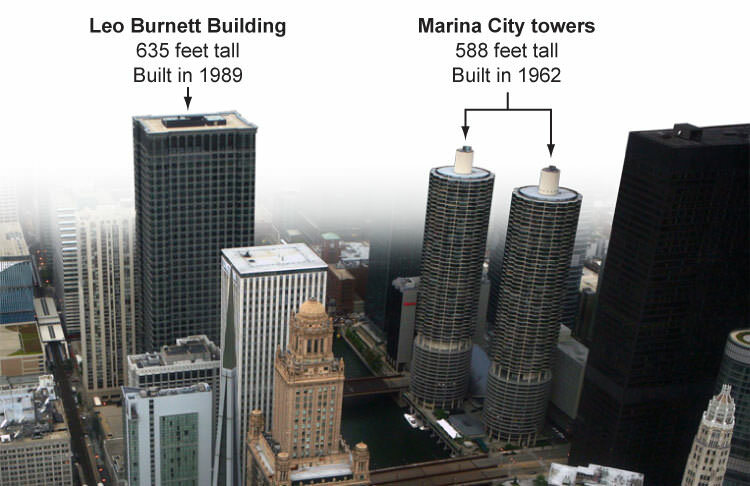 Wallenda will walk uphill at a 15-degree angle from the Marina City west tower to the top of the Leo Burnett tower across the Chicago river, and then walk blindfolded between the two Marina City towers. (Infographic here.) The towers have previously appeared in film when Steve McQueen chased a fugitive around the west tower’s parking ramp in The Hunter. 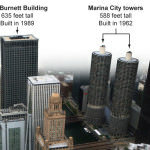 They were also featured on the cover of Wilco’s album Yankee Hotel Foxtrot. 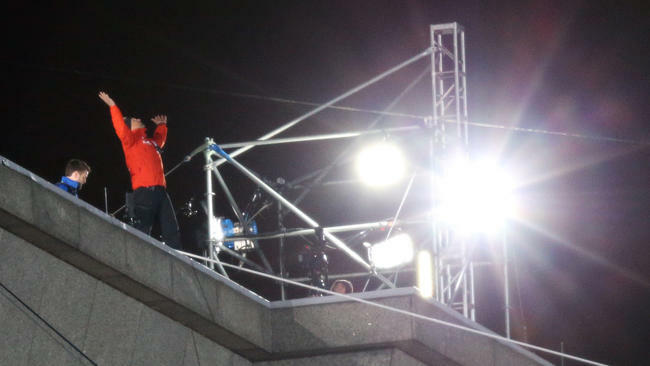 Discovery will broadcast the walk with a 10-second delay, allowing cameras to cut away if Wallenda falls. He will not use a net or harness for the walk. Preparations have taken months, with helicopters lifting cable to rooftops, roads closed, and clearances obtained from the FAA and Coast Guard. Residents of the towers have been asked not to use laser pointers, camera flashes, or drones, and are being prevented from grilling food. Wallenda has practiced the walk in Florida. I actually felt like my parents did everything they could to get me out of the business. In fact, I know they did. I was going to study to become a pediatrician, because the business had struggled financially and my parents were having trouble making ends meet. It’s centered on continuing to keep the name in the spotlight. It is definitely the most challenging walk I’ve ever done. We’re all taking calculated risks. I train for the worst cases, and if the conditions are worse than that, I simply won’t walk that wire that day. But I train to grab that wire and hold on for up to twenty minutes. And I have rescue crews who can get to me within ninety seconds anywhere I am on that wire, so it’s much more calculated and much safer than most could fathom. I preach about it all the time. My industry is completely contrary to me. Normally our job is to scare everybody and tell them how dangerous it is. But I’m a realist and I preach the truth, which is I believe what I do is extremely calculated and very safe. My great grandfather, Karl Wallenda, said life is on the wire, everything else is just waiting. And for our family, that’s true. He is the driving force behind our family. He always was…I’ve always though, How can I pay tribute to him, not to ever outshine him but to shine the light on what he did. It’s complex, but it’s simple. It’s simple because I’ve done it for so long. Walk a wire over an active volcano. I’m actually actively working on it. 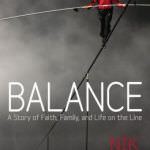 Wallenda releases a memoir, ghostwritten by Ritz, that details his family history, Christian faith, and his circus career. Ritz pitches the book to Wallenda after his Niagara walk. One of the challenges of writing a book is there’s things you probably don’t want people to know about you … It was very emotional telling these stories at times … It is a challenge to reveal your life story. That’s clearly the grounding that I stand on. That is who I am. I couldn’t tell my story without that. Do you ever get nervous, ever? He says he wants to walk between the Empire State Building and Chrysler Building, but New York City officials won’t give him the permissions he needs for the stunt. Wallenda walks across the Little Colorado River Gorge, part of the Grand Canyon in Navajo territory outside Grand Canyon National Park’s borders. The height of the wire, which is two inches thick, is 1500ft (460m), seven times higher than the Niagra crossing. Wallena has to stop due to wind gusts and to stop the cable bouncing. He praises Jesus Christ as he goes. He runs the final steps and kisses the ground, completing the walk in just under 23 minutes. Walenda performs a 600 ft walk, 180 feet above the downtown of his hometown, Sarasota, Florida. Props to my great-grandfather Karl Wallenda, because I can almost guarantee you he would have stopped in the middle of this cable and have done a headstand. Holy crap. Come on guys, it’s horrible…Who do I need to spank when I get down? Bird's eye view of Nik Wallenda's Sarasota Skywalk! About half way across the wire Wallenda crosses into Canada (he has taken his passport with him). He is buffeted by 14mph winds. I’m drained … My hands are going numb. I feel like I’m getting weak. Near the end he gets down on one knee, and blows a kiss to the crowd. In a recreation of the act that killed Karl Wallenda in 1979, Wallenda and his mother walk a 100-foot-long (30 m), 120-foot-high (37m) high-wire between the two towers of the Condado Plaza Hotel in San Juan, Puerto Rico. Delilah and Nik start at opposite ends of the wire. When Delilah reaches the middle of the wire, roughly the spot Karl had fallen, she sits down on the wire. Nik steps over her and the two continue to opposite ends of the wire. Nik also kneels down on the wire and blows a kiss in honor of his great-grandfather’s memory. This has been a dream of mine to recreate this walk. To be able to walk in his exact footsteps is an extremely huge honor, and I did this for him as much as I did it for my family to get some closure…I can’t even put it into words. It was so emotional. It’s a little windier than I expected it to be. It feels OK.
Near the end of the walk Wallenda stops, rested the pole on one thigh and waves to the crowd. Resuming his journey, he suddenly wobbles and buckles at the knees, squatting on the wire. 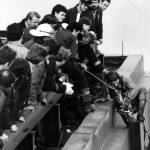 Wallenda then crosses the high-wire on an ordinary bicycle with the tires and handlebars removed. In the final part of the ride, the bike slides backwards. The back wheel started to slip … It was a little nerve-racking at the end. 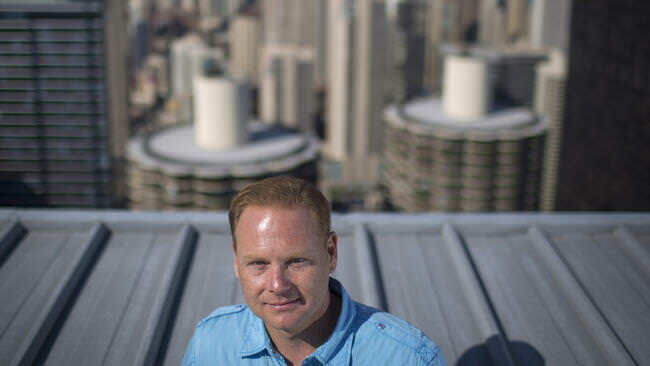 Wallenda regains control and finished, then jumps onto the roof of Prudential Center, where he hugs his wife and three children. Makes his debut as a professional tightrope walker at age 13. He has been practicing since his first walk as a toddler. 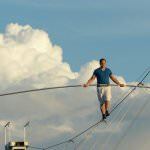 Nik Wallenda is born Nikolas Wallenda in Sarasota, Florida to Terry Troffer and Delilah Wallenda.He is a seventh-generation member of The Flying Wallendas aerialists family. The family, of Austro-Hungarian descent, have been circus performers since the 1700s. They were made famous in the 1920s by Nik’s great-grandfather Karl Wallenda, for their high-wire balancing acts without nets. Karl died during a high-wire performance in Puerto Rico in 1978.